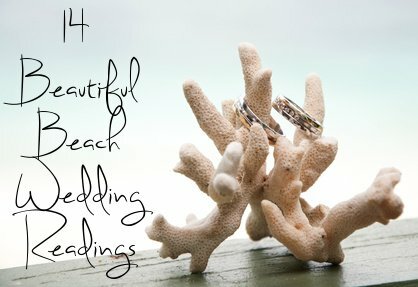 Your beach wedding readings can be as general or personal as you want them to be. There might be a particular poem, song or hymn that you empathize with or has a special meaning to you and that you would like to incorporate into your readings. Alternatively you could choose a piece from a book of love poetry, or spiritual readings. Ask one of your friends or relatives to read your chosen beach wedding readings or verses on the day. Just make sure that you choose someone who is confident and can project his or her voice. Especially if you will not have a microphone. Your beach wedding readings can be light-hearted or deeply moving. Make your wedding ceremony special to you in any way you can. After all, this is what the wedding is all about! Besides personalizing your wedding ceremony with meaningful readings you could also incorporate a Sand Ceremony. The following beach wedding reading is a cute little poem that has a wonderful playfulness about it and almost carries you away to a time when the mundane and ordinary was truly magical. It makes for a lighthearted beach wedding reading and is also a great addition to any pirate themed wedding. We'll lay and watch the skies above. And show you what it means to me. The cabin's warm with oil's glowing. Sipping tea as a soothing potion. To share the starry night with you, my love. Our bow dipping gracefully into the glowing seas. You shall behold the things that make women weep. And wool from only the most renowned spinners. But mostly the beauty that the sea has shown. As the sea birds sing with their siren-like cry. Shouting out with eyes bright and bawling. To come with me and be my love. The following beach wedding reading is the lyrics of a 1985 hit song by The Honeydrippers. Even if you do not use it as a reading in your ceremony, perhaps it is a good song to use somewhere in your reception either as an entrance song or perhaps even a first dance. Will you give me yourself? will you come travel with me? Shall we stick by each other as long as we live? All things by a law divine In one spirit meet and mingle. If you did not find anything you liked in the beach wedding readings above, then try and find some more inspiration for finding the perfect beach wedding reading or poem and creating a wedding ceremony that is truly "you", then perhaps have a look at Diane Warner's reference to beach wedding readings in her book Contemporary Guide to Wedding Ceremonies. This is a practical guide to wedding ceremonies and beach wedding readings that not only includes the traditional, but creative, personalized ideas for the twenty-first century bride and groom. 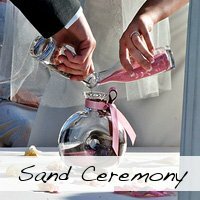 It also has a great reference on how to incorporate a sand ceremony into your service. 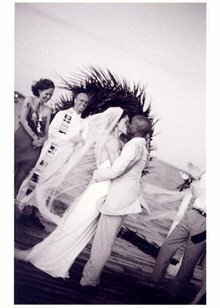 For more beautiful beach wedding readings for your ceremony try Wedding Blessings: Prayers and Poems Celebrating Love, Marriage and Anniversaries by June Cotner. In this book June has collected perfect selections for the bride, groom, members of the wedding party, and other family and friends to share. From verses and vows to prayers and toasts, the sentiments of Wedding Blessings will help make any marriage celebration more memorable. Wedding Blessings is filled with inspiration and timeless words by renowned authors such as Robert Browning, Rainer Maria Rilke, the Persian poet Rumi, as well as many contemporary writers that will make beautiful beach wedding readings. This spiritual, multi-faith anthology offers true gems suitable for all aspects of weddings, anniversaries, and vow-renewal ceremonies. Your beach wedding readings should contribute to your ceremony being as personal and memorable as possible. Take your time and do your research to find the beach wedding readings that will accomplish this for you. 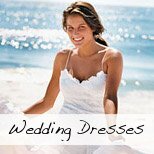 Follow this link to find a few more inspirational beach wedding readings and quotes.